Pear season arrives and intensifies as hotel low season sets in, as the rhythm slows, and as autumn materializes in a haze of morning brume and a carpet of sodden, fallen leaves. We arrive at the producer’s barn-like warehouse after 6 in the late afternoon and enter the murky cavern and breathe in that special odor of damp chill and fruit. There’s a huddle of old men who have each come to take home a crate of Comice, Conférence, or Williams. 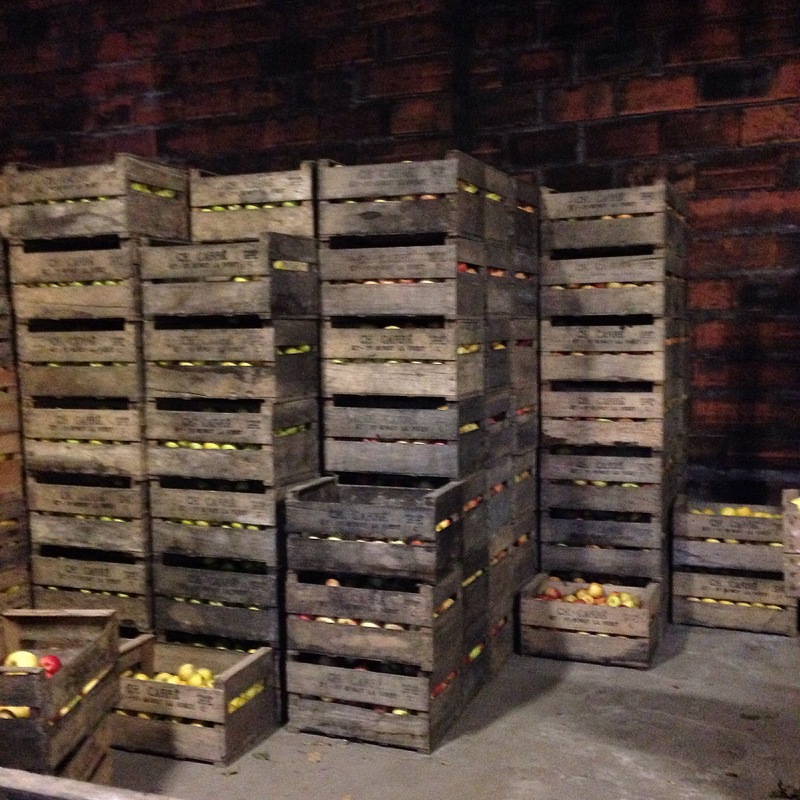 Or the last Melrose, Jubilé, or Elstar of the waning apple season. It’s promised to be a long and abundant pear year but we take what we can because we never know. That next call could answer our “Do you have pears today”? with a “Non, monsieur, c’est fini!” And I have jam to make. So we wait our turn, deciding how many kilos of which variety of pear to take. 12 kilos? 18? He weighs out our choice of Conférence and Comice, piling them into an old wooden crate atop his old retro scale, the arrow spinning up and around and finally landing on 12. I stand in awe and a warm sense of contentment staring at the dozens upon dozens of crates piled high against the walls, brown on brown, dots and dashes of gold, yellow, red, pale green, the colors of Autumn, peeping out between the slats adding brightness to the portrait. We lug our prize to the car and head home in the dusk. 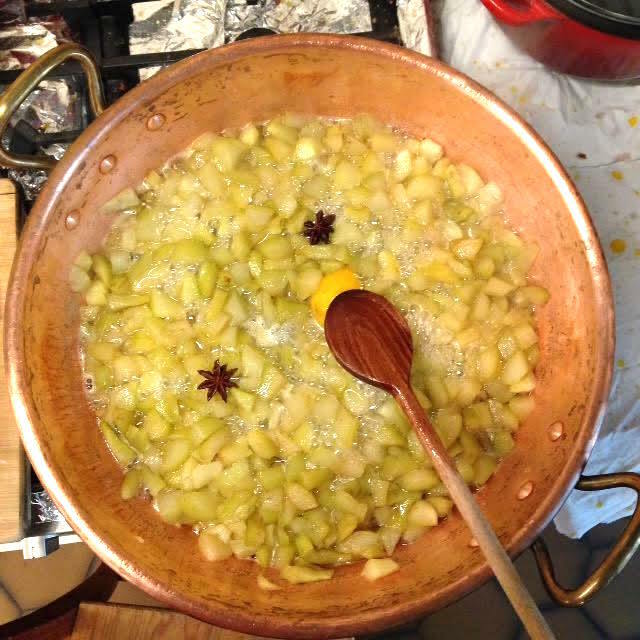 Pear jam is a staple at the Hôtel Diderot, pear cooked with vanilla or saffron or black currants. But in the 3 years that we’ve been here, I’ve added new flavors to the repertoire, my own twists and flourishes to what finds its place in the jam cupboard. This adds novelty and excitement to what could have become just a demanding chore, simple drudgery. I love experimenting with unexpected combinations of fruits, or spices and fresh herbs never before used in jams at the hotel, and even making jams from vegetables, pretty much unknown in France even though vegetables are commonly found in American and British sweets. I love the look of curiosity and surprise that lights up the faces of hotel guests. Pears are perfect things for jam, even as they are difficult to cook because of their low pectin levels, low acidity, and fairly high water content. They are slippery little things to cook, delicate in letting on when they are set. But they are excellent for adding fruitiness or sweetness to an otherwise bland, tart, or astringent fruit or a vegetable. I personally am not a fan of pears, but I love using them for jam, whether as a backdrop for another fruit, or the center of attention. 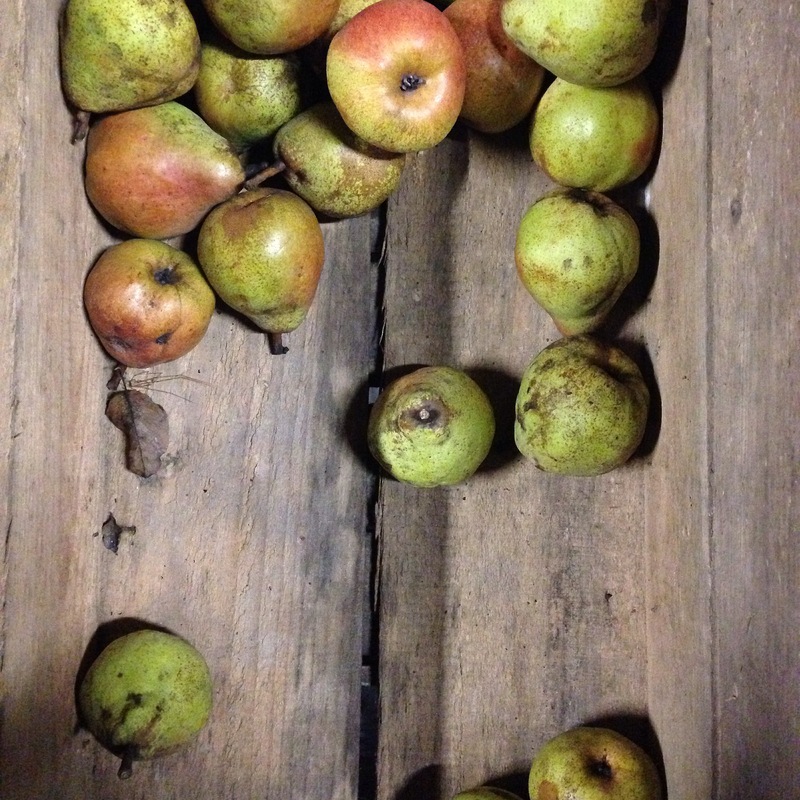 Pears are available all year round, but the local fruit, of which we are a proud and renowned region, is available for the short time that Autumn overlaps with winter. Before we bought the hotel, before I began using every ounce of fresh, seasonal, and, above all, local fruit for jam, I baked. I had my and my family’s favorites at my fingertips; these were my go-to, no-need-to-think snacks, treats, and desserts. Occasionally I forayed into the unknown and tried something new, a wild experiment or something culled from my collection of cookbooks. But once in a while my sons demanded something, most often cookies or cakes that they would bring to a party or dinner with friends. Once in a while, it was something just for us, just because. On one of these occasions, not many years ago, my older son had a hankering. I never understood how or where these desires came from (out of the blue) or what triggered them. When these urges came over him, I had little choice (at the risk of being labeled “Bad Mother”) but to drop everything, tie on the apron and mettre la main à la pâte. I best show an unparalleled enthusiasm in his project, stand by, smile on my face, offering guidance and advice when asked, admiration when not. On the day in question, he arrived at the apartment, grabbed the beautiful blue and white cookbook, La Cuisine de Vefa, that he had offered me for a birthday past, and began flipping through it rather single-mindedly and energetically. “Can we make this?” he asked, stabbing his finger at the recipe for Jam Tart. We set a date and I sent him away, urging him to make sure that he show up with the ingredients needed. He arrived the following day lugging a shopping bag and began emptying it onto the counter. I was wondering how much he counted on doing himself and how much of “his” project he expected me to make while he, oh, I don’t know, went and curled up on the sofa with the dog. But although he doesn’t bake often, when he does decide to prepare a dessert, he does it wholeheartedly. He does make the best Tiramisu in the world. He pulled two jars of jam from that bag and placed them on the counter. Wowee! He never settles for anything but the best and I knew he had found these jars of artisan vanilla-infused pear jam in the upscale, specialty section of the supermarket. But when I saw that they were pear, well, I am no fan of pear anything. But I bit my tongue and onward and upward. I left the kitchen for a while and next thing I knew, he had made the dough, calling me in to confirm that it was perfect. A super butter-rich dough, we wrapped it in plastic and allowed it to chill and firm up in the refrigerator. I later showed him how to roll it out, line a pie plate, and cut and create a lattice top. And we baked. 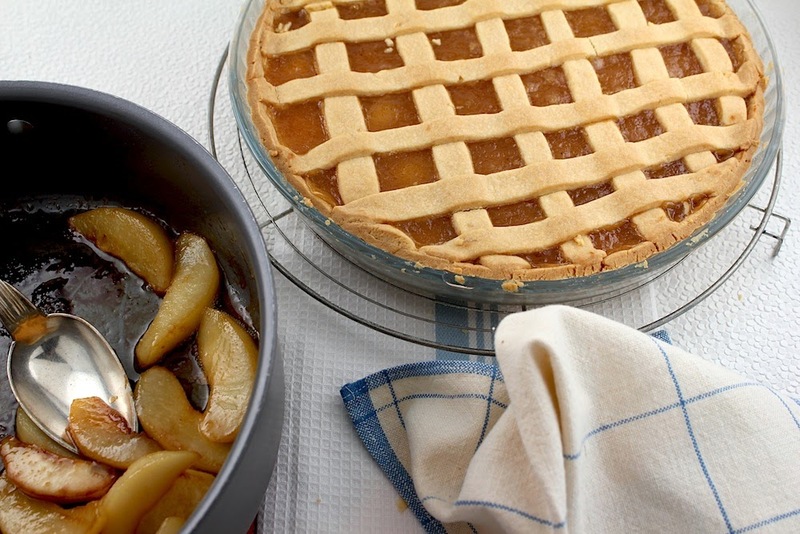 He then began preparing his personal touch to the Jam Tart: wedges of ripe Comice pears caramelized in plenty of butter and brown sugar until just colored and tender. 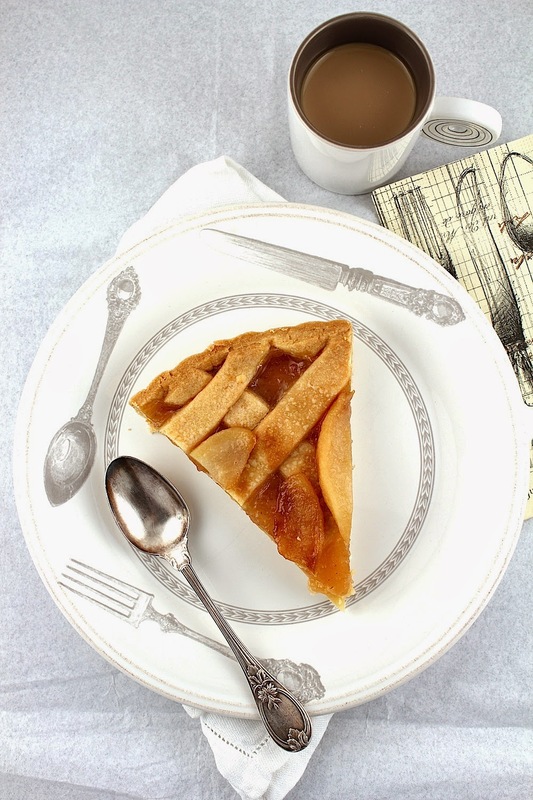 As soon as the tart was baked and out of the oven, the crust and lattice golden and puffed, he placed the hot, caramelized pears all over the top of the tart, drizzling the infused butter across the whole thing. We had dinner as the Jam Tart cooled and then… he left to go home, not in the mood for a sweet ending to the meal. And a week passed and husband and I – I might not like pears but this was fabulously good! – ate slice after slice, whittling it away to one more wedge and I texted him to no avail. 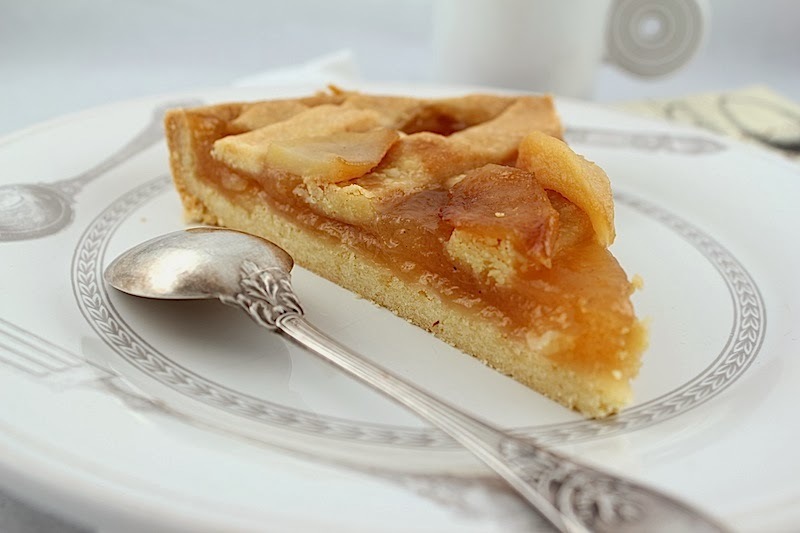 Son absolutely had to make this Pear Jam Tart in all urgency only to leave it for us to devour without him. And he never even tasted it. A simple yet elegant tart made with your favorite jam and a butter-rich yet perfectly cakey tart crust. Top it with buttery, caramelized fruit, if you dare. Sift or stir the flour together with the baking powder. In a separate bowl, beat the butter and sugar until smooth and creamy. Beat in the egg yolks, the eau de vie and lemon zest or the vanilla. Stir in the flour/baking powder and knead on a floured work surface until it forms a smooth, homogeneous dough, kneading in more flour if needed. Wrap in plastic and refrigerate until firm, at least 20 – 30 minutes. Separate off about ⅔ of the dough and shape into a ball. On a lightly floured work surface, roll out this larger part of the dough to fit a 10-inch (25-cm) pie dish, carefully lifting and placing in and lining the pie dish. Pour the jam onto the crust and spread evenly all the way to the edges. Roll out the remaining piecrust dough and slice (I use a pizza wheel) into ½-inch or so strips. Handling the strips very carefully so they do not rip and break, lift and place them on the jam tart overlapping the edges slightly to create a trellis/lattice pattern. Pinch the ends or each strip to the crust and trim. You can brush the crust strips with egg wash if you like. Bake for about 35 minutes until the crust and lattice strips are a deep golden. Remove to a cooling rack. Peel, trim and core the pears; slice into wedges between ½- and ¾-inches thick. Heat a skillet, add the butter, sugar and pears and cook, stirring so the melted butter and sugar blend (push and flip the pears gently so they do not break) until the pears are lightly colored, tender and caramelized. Spoon the pears with the caramel butter over the top of the tart and serve. This is a very butter-rich pie crust and can be difficult and fussy to work with so give it time to chill and firm up in the refrigerator before attempting to roll it out. The bit of baking soda added helps give the crust a firm but tender crumb. Of course, you can use any flavor of jam you like, but I do recommend an excellent quality jam - the better the quality the jam (artisan, if possible), the better your tart will taste. Apples get a lot of press at this time of t he year, and I like them. But pears are really better. They’re SO GOOD at this time of the year! I’ve never made pear jam — this looks really interesting. Good post — thanks. And hope you have a wonderful holiday season! And Happy Holidays to you and yours, John! I hope you are well. 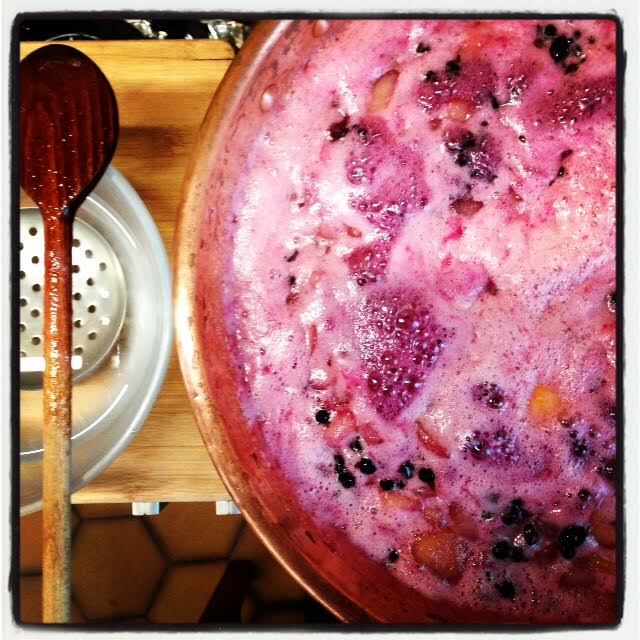 I’m much more of an apple girl (although my husband loves pears as is or in desserts) but they do make fabulous jams…. and this tart was extraordinary!